Gor Mahia and AFC Leopards have progressed to the quarter finals of the Football Kenya Federation Shield after winning their respective round of 16 matches on Wednesday evening. 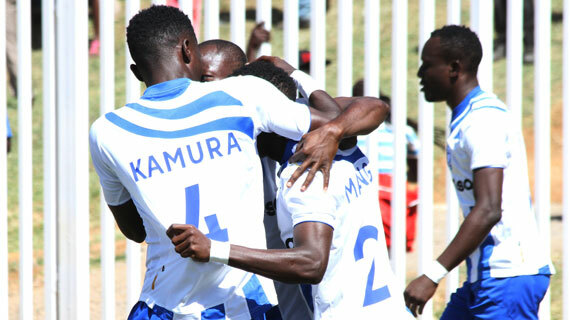 While Gor Mahia’s second team strolled past a full strength Posta Rangers, AFC Leopards survived a scare from lower tier side Mwatate United. Ingwe needed a stoppage time winner from Ezekiel Odera to complete a 2-1 comeback having come from a goal down. Mwatate broke the deadlock in the sixth minute through John Musyoka who came off the end of a beautifully executed counter attack. The goal startled Ingwe who had fielded a strong squad with the likes of Yussuf Mainge starting at right back while Marcus Abwao made his first competitive start since mid last year after recovering from injury. AFC leopards came off the break a better side and few minutes into the second half, new signing Eugene Mukangula drew them level with a well taken shot. They kept on pressing and Odera struck the decisive goal in stoppage time to help his team into the last eight. Ingwe has now booked a date against kenya Police who won their round of 16 tie 2-0 against Leysa FC over the weekend. In the late kick off, K’Ogalo who rested most of their stars for the midweek tie with the Yanga CAF Confederation Cup return leg tie lurking in the horizon were peerless against Posta. Posta though started brighter with Calvin Odongo hitting the crossbar early on. Posta failed to make the most of their early possession and they were punished for a defensive mistake in the 34th minute, Kevin Omondi breaking the duck. Kógallo were 2-0 up in the 52nd minute when Posta goalkeeper Boniface Barasa failed to handle a shot from Omondi, parrying it into his own net. Posta would revive hopes of a comeback when Paul Odhiambo halved the deficit in the 63rd minute but it was Samuel Onyango who made sure of progression with a third goal for Gor Mahia in the 70th minute. Modern Coast Rangers 1-3 Kariobangi Sharks, Friend Zone 0-2 Riverplate, Kenya Police 0(4)-0(3) Leysa (Narok Stadium), Vihiga United 1-2 Ulinzi Stars, Tusker 1-0 Bungoma Superstars, Sofapaka 4-1 Western Stima, AFC Leopards 2-1 Mwatate United, Posta Rangers 1-3 Gor Mahia.